In recent years, policy-makers and service providers have expressed concerns about whether and how Housing First can be applied to the population of young people who experience homelessness. In response, A Safe and Decent Place to Live was developed to provide a workable framework for Housing First for Youth (HF4Y). 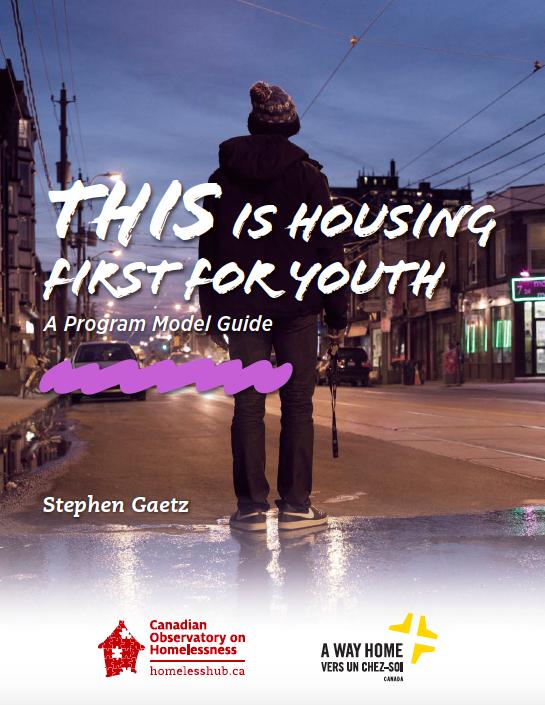 It is important to note that the development of this framework was the result of a collaboration between the Canadian Observatory on Homelessness (formerly the Canadian Homelessness Research Network) and two bodies that work with young people who are homeless: The Street Youth Planning Collaborative (Hamilton) and the National Learning Community on Youth Homelessness. Young people with lived experience of homelessness were an important part of this process, and provided necessary and valuable input. Much has changed in a very short time. Since the report was released, communities in Canada and elsewhere in the world (including the U.S. and several countries in Europe) have begun to implement HF4Y programs consistent with this framework. A downside of the growth in interest in HF4Y is that in many contexts, people are using the term “HF4Y” but not following the framework, by either simply applying the mainstream Housing First approach without adapting it to the needs of young people, or having unrealistically large caseloads and strict time limits. The ongoing development of our understanding of emerging examples of HF4Y, combined with a need to clarify how it actually needs to be implemented on the ground, led to a consideration of the need to build on the framework and develop a more comprehensive HF4Y program model guide. In order to move forward, we engaged in an extensive consultation process in Canada (led by A Way Home Canada in consultation with the National Learning Community on Youth Homelessness), the U.S. (involving the National Network for Youth, the United States Interagency Council on Homelessness, the U.S. Department of Health and Human Services and a large number of communities) and in Europe (involving FEANTSA and FEANTSA Youth, Focus Ireland, Rock Trust (Scotland) and others). We also consulted experts like Dr. Sam Tsemberis and Wally Czech as well as those applying the HF4Y framework in the field to get their feedback. The considerable insights and expertise of these individuals and organizations has contributed to the enhancement of an effective and achievable model of HF4Y, which is outlined in this new program model guide. A Safe and Decent Place to Live and the forthcoming THIS is Housing First for Youth program model guide are intended to provide guidance for communities, policy-makers and practitioners interested in addressing the needs of developing adolescents and young adults through the application of HF4Y.